India's troubled airline SpiceJet has grounded flights after oil companies refused to refuel any of its planes, reports say. The debt-ridden carrier owes money to creditors, including oil companies. The ministry said the measures were aimed at avoiding a collapse which it said would be a "major setback" for the airline industry. Correspondents say the government hopes to save jobs and prevent a repeat of the high-profile collapse of Kingfisher Airlines which was grounded in 2012. 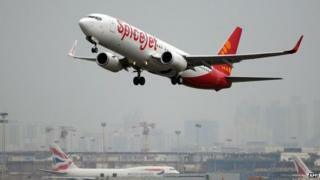 It is not clear, however, why oil companies have refused to refuel SpiceJet planes after Tuesday's announcements. "Not even a single flight has taken off this morning due to fuel supply issue with the oil companies," sources in the SpiceJet told the BBC on Wednesday. SpiceJet has $314m (£200m) in debts and it is looking to raise funds. The company has been unable to pay its dues to staff, airports, tax authorities and its lenders. The airline, which has been making losses since last year, is also battling refunds for customers and forced flight cancellations. It has already cut the size of its fleet by a third since September and cancelled dozens of flights a day for the rest of the year. The December holiday season is busy for India's airlines - but it's a nervous time for anyone booked to fly SpiceJet. Last-minute cancellations on Tuesday left thousands stranded - throwing plans into chaos. It's shaping up to be more of the same on Wednesday. Rival airlines might get a short-term boost if SpiceJet passengers who can afford it choose to rebook elsewhere - and we're already seeing prices jump on popular routes to places like Goa. Many analysts think SpiceJet's collapse is inevitable - that the problems are too fundamental to turn around without massive investment. That would be a blow for the industry where the 2012 failure of Kingfisher Airlines is still fresh in the mind. And perhaps a reminder that the incessant fare wars between rival carriers are unsustainable. Why have India's airlines hit turbulence?